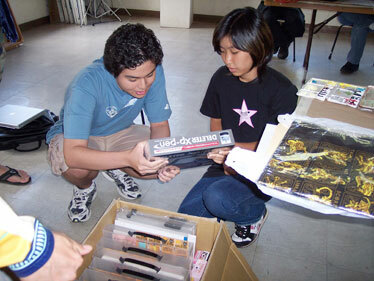 MangaBento art contest winners Brady Evans, left, and Kara Kansaku look through art supplies offered as prizes. The future of anime and manga fan art is in good hands. That's the impression I got a few weeks ago when I attended a meeting of MangaBento, the group of fan artists that meets at the Academy Art Center. A special tip of the ol' cat-eared hat goes to Malia Helser, 13, of Lahaina Intermediate on Maui, whose entry traveled the farthest. It should be noted that Kansaku is a repeat winner, having placed first in the over-15 category last year. A few weeks ago, Funimation announced that it would be picking up the license to the seafaring pirate series "One Piece." The news was greeted by much rejoicing and dancing in the streets. Well, OK, so maybe it wasn't THAT dramatic, but fans were still pretty happy. The license had once belonged to 4Kids Entertainment, after all, the production house reviled by hard-core fans for taking perfectly good series like "Tokyo Mew Mew" and "Ojamajo Doremi," tossing out chunks of the original scripts and turning them into sanitized, kid-friendly ... shudder ... cartoons. More details emerged in an interview that Rob Bricken of AnimeOnline.com conducted with Funimation Marketing Director Lance Heiskell and Production Manager Justin Cook. Cartoon Network will continue broadcasting the series, and Funimation's version, with a new English dub cast and many elements restored, will begin with episode 144. The agreement to pick up where 4Kids left off meant strict deadlines that leave little time to go back and redo the first 143 episodes, Heiskell told Anime Online. The company could do uncut DVDs of those episodes if public demand is there, though.